Just in case you (which would probably just be refering to me later in life) were wondering, I had another crappy long run last weekend. But I don’t wanna talk about it. There is a 16 miler this Saturday that I am trying not to freak out about. So let’s talk about clothes, ok? Yeah. happy happy. 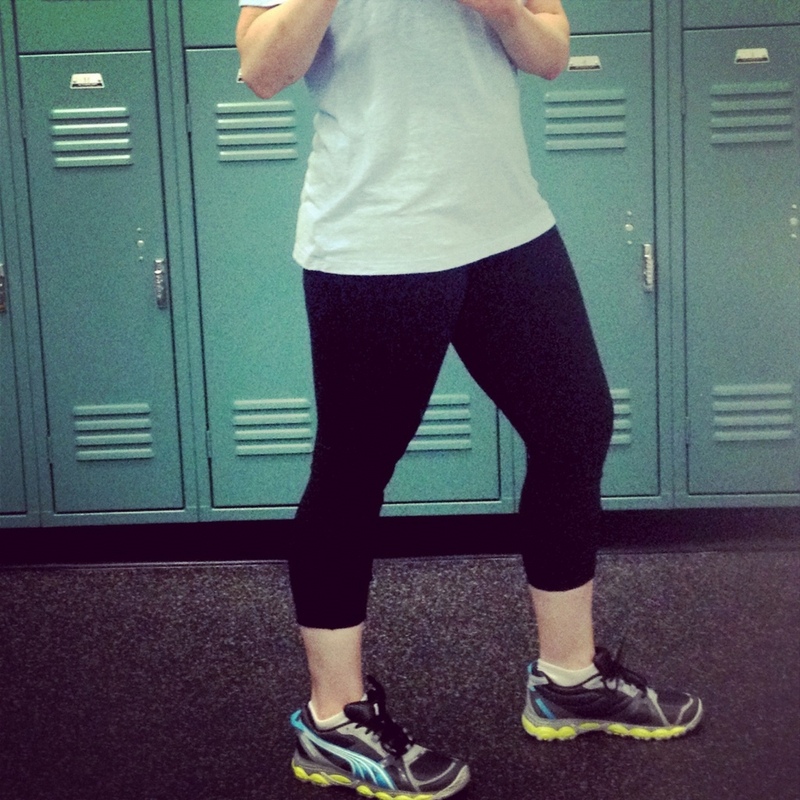 I want to introduce you to my newest obsession: Old Navy workout clothes. You read that right. Old Navy. Like the place to get $15 sun dresses, $20 jeans and $8 tee shirts can also serve up some redonk performance wear. I was first introduced into this hidden gem earlier this year when I was looking for a thicker capri pant. 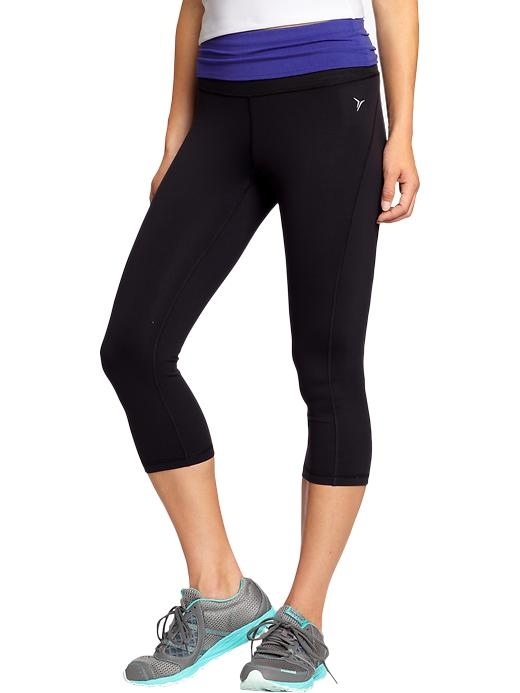 I already have the Under Armor Hear Gear capris, but I was looking for something a bit warmer, to get me through the later winter and spring and for use in the gym (see previous workout wear Wednesday rant about my distain for shorts). I spotted these rusched babies among the traditional foldover yoga pants, but cotton they are not, and they had potential so I took ’em into the fitting room. To my utter surprise they were super flattering and the perfect weight. Also, they were $24. SOLD! Now that I’ve had them for a few months they are, by far, my favorite workout pants. It feels like they have some superhero compression and seaming because I SWEAR (like really really swear) they make my legs springier and lighter. I can’t find this exact version online, but these look most similar. Mine have some ruching detail on the outside calf area (which I happen to like) and a zippered key/phone pocket in the back of the waistband. Though I do love the compression so much that it’s worth seeing if these feel the same. I just branched out into some summer Old Navy workout gear (review to come) and now I am wondering if I would love the 3″ compression shorts too? At $15 it might be worth a try! It’s Wednesday. You did it! Those are cute. Also I saw you running on the bridge as I was coming home on Sunday and that was cool. Ha! I know. It’s harder to keep it up than I thought it would be. Buuut that neon top you saw me running in on Mem Bridge is old navy too and I love it. Also, next time you MUST honk, or whistle lasciviously. I did. In my head. I think I was so stunned, I couldn’t react!